If you’ve ever been given an assignment that asked you to find and use primary sources, this is the website for you! With words and graphics, we’ll show you what primary sources are, why they are important for understanding the past, and how they present unique rewards and challenges. When you are finished with this module, you'll know what kinds of sources would count as "primary" for historical research projects. 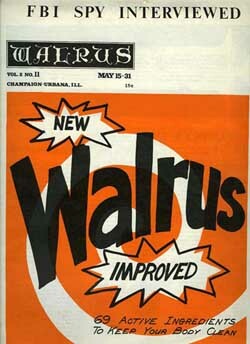 You'll learn, for example, that a source likeThe Walrus (right), a UIUC student newspaper published by self-identified members of the "New Left" from 1968-1973, would count as a primary source if you were doing a research project on anti-war activity at UIUC during the Viet Nam War.